I'm sure most of you found it through my BookTube channel, but if not, here's a little about me. My name is Kassidy, I live in Louisiana, I am 22 years old, and a graduate student studying for my Doctor of Pharmacy. I did not discover my passion for reading until high school, but I have been an avid reader ever since. I mostly read Young Adult fiction, and any genre within that category. However, I will branch out to Adult Fiction some times. I started my BookTube channel (a YouTube channel dedicated to reading and books) in June of 2013. BookTube has truly been one of the best experiences of my life. I am still currently making BookTube videos, but I decided I wanted a book blog as well to supplement my channel. 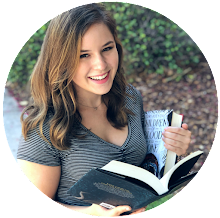 I have been reading book blogs since before I started my BookTube channel. I always thought about starting one, but the idea intimidated me. However, I started putting more effort into writing book reviews on Goodreads and Booklikes, and I realized that I like doing it, so I created a blog. I'm a little nervous about how this is going to go, but I am very excited as well. I plan to focus mainly on book reviews, but of course I am open to doing other book-bloggy things. This will definitely be a learning experience for me, but I am looking forward to it, and I hope you are too! Thanks so much! I definitely will. LOVE your new blog! It's going to be great! If you like Nick Jonas have you checked out Kingdom? The first season is over now, but I'm sure you can catch it on Netflix in a couple months (or on DVD). Nick is part of a family of MMA fighters, it's pretty good! I knew of the show and that he is in it, but I haven't had a chance to watch it yet. I definitely want to! I hope it gets on Netflix. I can't believe your 20 years old. I've been thinking your 16 ! Wow, we are the same height, I've also never enjoyed playing sports, and your birthday is in the same day as mine (September 12). Are you from 1994 too? I like your book blog ! I have known your granmother Dianne and grandfather, Errol, for over 50 years and was around when your dad was born. And Donald Fleet is in my all time favorite people bpook! You are adorable and so talented. I am looking forward to reading your blog and finding recommendations for books for my grandchildren. Keep up the good work. Dear Miss Voinche, I couldn't find your email address anywhere on your blog,nor on YouTube. I'm an author and would like to ask about the possibility of a review as well about your criteria. My Best Regards, Bruno Santos. Kindly let me know how this is possible.